In my mind, the main purpose of all our human lives is the love of wisdom and the wisdom to love. If you do that, you are probably leading a happier life. 1. Take care of your body. There are so many wonderful and different bodies out there but the only perfect body is yours. If you’ve made it imperfect by believing it was imperfect, it may be time to bring it back to it’s perfectly natural state as you possibly can and then honour it this time. Virgo, Vesta — the 6th house asks us to have daily practices that bring health and wellness into your life. Search these practices out, if you don’t already have them. 2. Everything that happens to and around you are lessons for you to learn from. In many ways we are all children, no matter our age. 3. Enjoy the happy accidents. Perfection is in imperfection. Failed plans are opportunities for something great to happen. Embrace what you didn’t expect. Expect the unexpected. Let Uranus guide you in discovering what life has to offer, in all its irregular shapes and sizes. 4. Patterns. If you find yourself making the same mistake over-and-over again, you likely have an aversion to learning or graduating from a course of learning. Life can be tough and maybe you want things easy so you figure it’s better to sit in a pile of mess you’re comfortable with then get out of it and start some other pile of mess. You’re wrong. After you pass that one lesson, it’ll make the next easier to handle and you’ll gain confidence and joy. If you have Saturn in your 3rd or 9th houses: Blocking the road to wellness, out of fear of having to take responsibility for the life you lead, may be one cause for repetition and failure to learn. But it’s not the only signature because I don’t have Saturn in those houses and I have failed to learn many things and have had to go through it all over again. What I’ve been learning to do, is to slow down. I think one personal signature that has casued me to repeat lessons not learned is Mars Square Saturn. 5. The work is never done so learn to enjoy whatever you are doing, in the moment. Flow. Flow from one lesson into another. A never ending sea of Neptunian delights. Let everything inspire you (The Sun) towards a magical life. 6. Wherever you are, is where you’re supposed to be. Be in the moment. 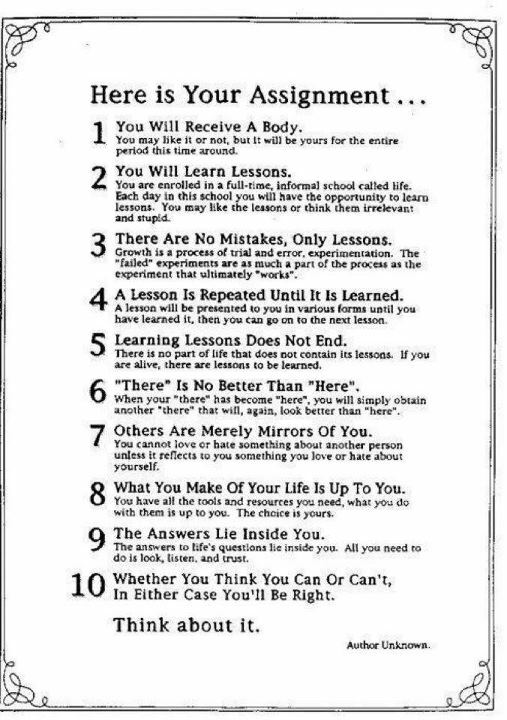 Learn every lesson. Even if you don’t like where you are, it’s only temporary. It’s always only temporary. Remind yourself of that. You’re never where you want to or will be, so enjoy being where you are. 7. Projection. We all have a 7th house. We all project. If you have something nasty or nice to say about someone else, that’s because it’s within you or was within you. You can’t know what you don’t own (by the way, know contains the word own, k is silent). And what you love or hate about someone else is what you love or hate about yourself. So the next time you find yourself admiring someone else (like me, Oh so Leo. ;p) remember to admire that about yourself!! Yes, it might not be as ‘out there’ but you have it. Update: The psychological term for #7 is called, projection or displacement — I really wish a lot more people would get this… then again, it’s kind of cool to learn about how people view themselves (through others). Listen to what people have to say, good or bad about others and they are telling you about themselves. If they’re quiet or don’t ever say anything about other people, be afraid — be very afraid. And even though I know of this phenomena, I STILL will make note of the good and bad that I see, myself. Having said that, if you’ve been taught to recognize something in others (say you’re law enforcement, psychologist, or you’ve read some articles about something you knew nothing before about etc…), then it may not be a projection. The important thing is not to stop noticing good and bad in others, but to notice that that good and bad exists within you too. That’s when the magic of compassion, understanding, and self-development ignites. 8. As an adult, you have everything you need — all the resources you could ever want is currently at your feet, a phone call, chat, or walk away. You’ve been provided with everything you need, in this moment — remember it. It may not be in the package you readily seek but you have it. It’s there to be taken and if you don’t know how to take it, wellness providers (like myself) can help you tap into these resources. 9. As a psychic I can’t remember how many times I’ve said this. And this is another reason why I created TarotSeek. The best answers lie within. You know everything. Yup, there’s nothing you don’t know. You may not be able to always put words to it and it might be buried deep, but you know everything. As a tarot reader, I connect with you to access the answers you and others hold. I’m not godly, I’m just connected and present. So I ultimately don’t believe in regular tarot readings. I believe in my style of tarot reading (when you don’t read the cards all by yourself) which is about accessing YOUR wisdom and that’s why I’m YOUR Wisdom Guide! 10. When I teach people tarot, I always tell them that no matter what they say — they’ll always be right. Tarot is story telling, telling true stories. But if they think they are not allowed to read, they won’t succeed. However, one of the things I do give freely to others is confidence (Sun in the 7th) so when you work with me. you’ll very likely achieve things you never thought you could. Just try to remember that I helped you along your way and let other people know too so they can benefit from my gifts as well.